Blogs are fun and useful for getting introduced to new topics and conversations and getting updates on old ones. What they can’t do, however, is establish a foundation of knowledge upon which competency is built. So, in addition to having a blogroll, I thought it might be nice to have a bookroll. The following are some key books that have been part of my foundation or have been significant in the field. I’ve tried to limit the number of books that I haven’t actually finished, but there are a few worth listing based on the strength of the author or influence of the book. If I haven’t read the book, I make this explicit in my short notes. These notes don’t even pretend to be a book review, just a couple of personal comments to keep the list from being too sterile. Also, I’m not listing every book I’ve ever read on development, especially the theory-heavy anthologies or the equation-laden development economics textbooks. I’ve read these too and they also form part of my foundation, but I have no illusions of general interest in these. Each book is linked to Amazon.com. As best as I could, I tried to use the date the hardcover was published. However, the links vary from hardcover and paperback. I was assigned to read this book in Stephen Peterson’s course on the Management of Development Assistance Projects at Harvard. And this is a good example of the value of graduate school – I wouldn’t have just found this 1967 book at Barnes & Noble and picked it up on my own. And, I can’t tell you how many times I’ve used his concept of the “hiding hand” in my everyday work. In short, the under-estimation of our creativity to overcome difficulties is often offset by the under-estimation of the difficulties a project will face. Our pessimism and optimism cancel out and we end up taking on tasks that we would not have dared to had we fully understood its difficulties upfront and coming up with solutions that we could not have had we not already gotten ourselves stuck in a jam with a project we committed to. In this way constraints and factors of success are two sides of the same coin, where uncertainty (conceptual, political, resource) is the key constraint and commitment and learning, the key factors of success. Really good book – out of print – really hard to find. A contemporary classic! One of those books for which “seminal” is not hyperbole. And one of the reasons I so adamantly push for monitoring and evaluations strategies to move away from having an extractive relationship with the communities in their projects and begin giving the information back, and letting the community validate it, reflect on it, and tell project managers what it means for them and for the project. I also think the role of sector experts should be one of consultancy to the community, and this would probably go over well with Dr. Chambers. Bryant used to be a colleague of mine at World Vision. After nearly 25 years serving there, he’s now teaching down the road at Fuller Seminary. The book is somewhat academic and long, but readable and full of great references to both development thinkers like Chambers, Anderson, and Korten, and theological thinkers like Newbigin, Bediako, and Kraybill, as well as a whole bunch of my colleagues, including my boss, which is kind of fun for me…probably pretty irrelevant for you though. He also managed to include James Gleick in his biography, which every author really ought to try for. Dr. Sen’s first book after winning the Nobel Prize for Economics in 1998. He argues that expanding freedoms – economic and political – are both a means and an ends in development. Not an easy read, despite the inviting title and cover, but Sen is never an easy read. An important book, nonetheless. Alright, I’ll confess up front, I haven’t finished this book…don’t know if I ever will. I did bring it with me to Colombia with the intention of finishing it this year…it’s just hard, well, how do I say this…it’s just hard to take this book all that seriously. Sorry to the gajillion Sachs and Bono fans out there. Sachs did help found the MPA/ID program at Harvard where I got my masters, and he did help Bolivia find a path out of the hyperinflation in the mid-80s when he was just a boy, and I do occasionally appreciate aspirational writing and aspiration goal-setting (e.g. the Millennial Dev’t Goals)…but I just have a hard time getting into the hyperbolic claim of ending poverty in our time. What the book has seemed to achieve, however, and I’ll give it credit for this, is that it has taken some of the wind out of the popular cynicism surrounding development work (especially by those on the inside actually doing the work!) by pointing out that there are lots of examples of things that have gone relatively well and seem to have made a real difference in improving people’s well-being. I’m not going to be making any promises on finishing this one though. Relatively easy to read, relatively short, relatively meaty. I think “traps” are a useful way of thinking about failed states, those countries that are failing to ride the wave of development toward a better future. Traps like intractable and seemingly endemic civil wars, bad governance with corrupt leaders, and dependence on extractive non-value add industries are not standard development problems and standard solutions won’t work. He makes a good argument in favor of some specific non-standard solutions, all of which require (perhaps unfortunately) a high degree of international cooperation and coordination. I can’t imagine how I would have survived more than a month in rural Bolivia without this book let alone 5 years and a cumulative 7 years in developing countries. Whether avoiding Chagas disease, diagnosing a weird skin rash, putting my neighbor’s dislocated shoulder back in its socket, discussing the possible causes for the puffiness of a neighbor’s baby’s eyes, or supplementing the community health worker’s scant training with some additional one-on-one sharing, this book helped me stay healthy and my neighbors too. Simple, well-illustrated, uncluttered, usable and useful. Don’t leave home without it! Whether for political, environmental, or economic reasons, when you want or have to make more with less in terms of food, this is the book to have. When you’ve got no refrigeration and can only get the market once a week and you’ve got about a dozen ingredients in your cupboard not counting spices, it is a great relief to have help like this within reach. It also comes in useful when, during such-and-such vegetable or fruit harvest time, your neighbors bring you large sacks of a particular item and you’ve now got to figure out how to not let it go to waste. Bill’s a funny, if cantankerous, guy -both in person and in his writing. But, he’s also a very serious thinker and not nearly as cynical as he comes across sometimes. He’s a bit like the opposite of Sachs in some ways. Whereas Sachs is aspirational and hopeful to a fault, Easterly is practical and critical…almost to a fault. In the end, though, he does offer a way forward – nothing like the pie in the sky MDGs – but by calling on development economists to act like economists and apply good economic principles to policy work and to the designs of development aid programs. Haven’t read this one yet – sure I will eventually. Listing it here based on strength and influence of author. 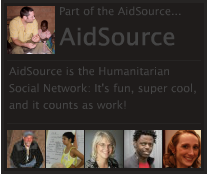 BTW, Bill also keeps a really great blog called AID WATCH. It’s really a project of New York University’s Development Research Institute, which Bill leads and he does most of the posts. Okay, so here’s another one I haven’t read yet. I’m listing this here because it seems like it would make a great counterpoint to Sachs’ aspirational End of Poverty and MDG stuff. A bit soap-operay too since the writers are at Columbia Business School (Sachs heads the Earth Institute at Columbia.) According to one review, “the authors dissect and disagree with the … pet project of Jeffrey Sachs.” Buuuuuut, hey but, they also offer up as their solution a bit of a grand thing too – the new Marshall Plan. mmmm, just sounds aspirational doesn’t it? Well, if any of you have read this and want to replace my speculative drivel here with some real information on this book, please be my guest. Seeing Like a State: How Certain Schemes to Improve the Human Condition Have Failed, by James C. Scott. This isn’t really a book about development aid, but rather an epic sweeping condemnation of social engineering programs and authoitarianism. He seems to touch on a little of everything, from Soviet collectivization to the planning of Brasilia, from the rise of German forestry to how people got their last names and why. 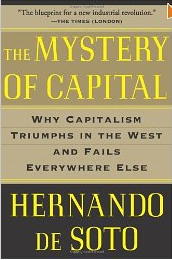 The theme that runs through it all is that “high modernist ideology” – that firm belief that you’ve got the answer that the world needs to progress – fails in its lack of humanity, its failure to recognize that messiness and informality and practical knowledge on the ground are indispensable. (You can see now why I’m including it here?) I confess that it took me forever to get through this book – it’s long (like 500 pages) and super dense, but I didn’t give up because every time I picked it up I got a good brain buzz going and not every book can do that. I had lunch once with Hernando de Soto. He’s a big guy, both physically and charismatically. He’s also got big ideas and knows how to present them well. A Peruvian economist, he thinks deeply about the issues that are relevant to his part of the world, issues that you and I might not find at all obvious, like the importance of titling property in order to transform in from property to capital, like why a poor street vender might actually want to move from the informal sector to the formal sector despite being taxed, and what the wild west can teach us about the development of legal institutions in the developing world. A very good read. This, on the other hand, was a bestseller – deservedly so. An epic big picture that tries to answer why certain societies developed to the point they were able to go out and colonize others rather than the reverse. He ties the historical patterns of development to endemic resources. Enough local resources in terms of domesticable plants and mega-fauna, water and arable land, etc. and local people groups could begin to specialize and build larger population centers. Political, merchant, and military classes could emerge and eventually find a reason to go out and take over their neighbor’s land. What the book doesn’t do a good job at addressing is modern patterns of development that break out of the historical resource constraints or failures despite sufficient resources. But, a convincing story up to about the middle of the 19th century. See notes above in International Development (General-Contemporary) section. This is a collection of writings from about a dozen of my colleagues at World Vision. I’ve not read the actual book, but I know most of the authors and their views on transformational development. 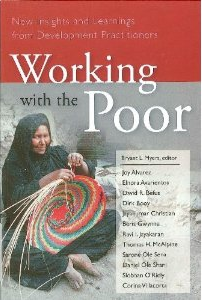 This looks like a good and timely addendum to Walking With the Poor. I just had this book recommended to me by two different people. I haven’t read it yet, but I thought I’d drop it in here anyway. I’m a fan of the Do-No-Harm framework as well as an integrated asset-based approach to development. I just hope this book doesn’t overlap too much with the book I’m writing – Staying For Tea: A Principled Path to International Community Development. I guess I’d better buy it and find out. I bought this book in the Fuller Seminary bookstore with the idea of using it as background research for a chapter in my book on cultural competence in international community development. Turns out that I’m going to let Josh Armstrong from Gonzaga University write most of that chapter, so I’ve got this sitting on my bookshelf looking dejected. Sorry my cute little blue book – you’re not going to get read this year after all. I’m in the process of listening to this book on my iPod. It was a free download from christianaudio.com a few months back. I met Richard a couple of years ago when he invited me up to Federal Way to discuss theodicy with the staff of World Vision USA. (I know it’s boasting, but he said that mine was the best treatment he’d ever heard of why bad things happen to good people and what this teaches us about God and ourselves.) Over lunch he shared with me his story of responding to God’s leading him from being in the private sector, where he was a fairly successful CEO, to the Christian non-profit sector. It’s a compelling story that set in motion a long process of reflection that eventually led to this book. Another book by a colleague and dear friend. Coincidentally, his daughter is a “Krista Collague” at The Krista Foundation for Global Citizneship where I’m a Board member. A well-written counter to the overblown criticism from the antiglobalization camp. Interestingly, Bhagwati is a colleague of Stiglitz at Columbia University. Despite the seemingly opposing titles of their books, they actually agree on a lot. Bhagwati takes a cautious yet optimistic view of globalization, insisting that it can be a force for economic, environmental, social, and political good. But it must be managed in order to avoid detrimental economic and social side effects. The Political Economy of International Relations, by Robert Gilpen. Thee required text for all students of IPE. Dense and not very readable, but essential nonetheless. Now considered more of a historical look at IPE because a great deal has changed since its publication in 1987. 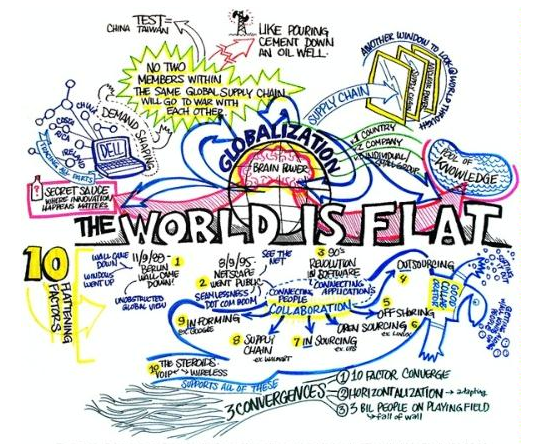 Global Political Economy: Understanding the International Economic Order, by Robert Gilpen. Originally intended to be an updated second edition of his 1987 book, Gilpen realized that too much had changed, including his own ideas to simply update an old text. So, in 2001 he published an entirely new book. Let’s hope he doesn’t wait another full 14 years before giving us another “update”. Common Fire: Leading Lives of Commitment in a Complex World, by Laruent A. Parks Daloz, Cheryl H. Keen, James P. Keen, and Sharon Daloz Parks. One of the biggest problems in ID work is the dependency syndrome as discussed by my friend Glenn Schwartz in his book “When Charity Destroys Dignity.” I think you might enjoy having this in your library as well though from the looks of your list of “not yet read this one” it would surely take you a while to get to it. I know how you feel. I just finished Rapley’s “Understanding Development” and thought it was a great read, though afterward a friend informed me he is a Marxist. I gets its getting harder and harder to pick them out from the crowd. I love Easterly’s writing and I wouldn’t bother finishing Sach’s work if I were you. Its just all about the need for the materially rich countries to spend more in development. I have been surprised at how many development “experts” don’t address the issue of culture. In this regard I like Harrison, especially with respect to Latin America where I live. Sorry, one other recommendation. In the arena of global health none come close to my Dan Fountains work “Health, the Bible and the Church” written in ’89 and which I am trying to get him to revise soon. It is a BGC monograph (where you can get it for $7) which I use as a textbook for the Primary Health class I teach online. Relatively short read but really gets to the heart of the matter when it comes to global health. OK OK I have just one more. I know you would thoroughly enjoy James Hunters “To Change the World.” Excellent read. Thanks for the recommendations. They are always welcome. I just found your bookroll! It needs bigger prominence… maybe in your sidebar? I’ve also just ordered two that are right up my line of lifelong interest: Cultural Intelligence (I wish I’d come across that phrase earlier), and Whose Reality Counts? Thanks. I wasn’t sure if anyone would be interested in a bookroll. This encourages me to finish this page up one of these days. Although, I suppose it will always be a bit of a work in progress, right? Let me know how you like your new books. Hi, fellow auditor! Interesting stuff! Could you elaborate on your book review of Rich Stearn’s Hole in our Gospel – “he said that mine was the best treatment he’d ever heard of why bad things happen to good people and what this teaches us about God and ourselves.” – have you posted it anywhere? I always need to take short rest after reading your posts! Keep it up! I would suggest “The Anit-Politics Machine: Development, Depoliticization, and Beauracratic Power in Lethoso” by James Ferguson (that might fall under your Aid Critque and/or History and Theory of Development) and one quite controversial book on the aid industry itself: “Cultivating Development: An Ethnography of Aid Policy and Practice” by David Mosse (a British Anthropologist). Thanks for the suggested reading Heather. Welcome to WVI. Are you on Yammer yet? Maybe I’ll see you there. Thanks for the recommendation Julian. Please add, A School for My Village by Twesigye Jackson Kaguri. This is a story of a man from Uganda who is now living in the US who returned to his village in SW Uganda to build a school for AIDS orphans and how the project has grown to include the entire community. I am now following your blog and have found very helpful in my work in Uganda. Amazing Blog, good books. Keep Going.